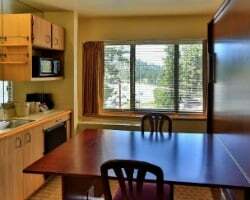 Located at the base of the Lake Tahoe area's best slopes, the Tahoe Seasons Resort provides the perfect accommodations to enjoy a winter or summer trip. Browse SellMyTimeshareNow.com for timeshare resales and rentals priced up to 70% lower than retail costs. What’s My Tahoe Seasons Resort Timeshare Worth? Nestled perfectly in the Sierra Nevada mountains above Lake Tahoe, the Tahoe Seasons Resort provides a spectacular vacation experience unlike any other. Just minutes from the slopes and deep blue waters of the lake, you'll be in the perfect position to discover the area's best attractions. Walk over to the lifts in Heavenly Village to hit the slopes, or explore the lake and state parks that line the area for unbelievable sights and photo ops. On-site, you'll find a full-fledged vacation resort that caters to your needs. Find a bar and grill right on the property for easy dining solutions, relax by the pool during the warmer months, or even head up to the roof to enjoy tennis, shuffleboard, and more. Accommodations at the resort range from one bedroom efficiency units to two bedroom suites with room for up to eight. You'll find that your timeshare at the Tahoe Seasons Resort provides a home-away-from-home for you to stay each and every year. 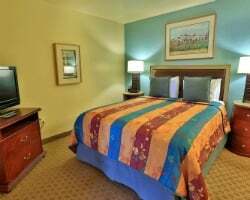 Enjoy the suites' homelike accommodations which include comfortable modern furnishings, convenient kitchenette areas, premium bedding, and even a gas fireplace. No matter who you're traveling with, everyone is guaranteed to have enough space and comfort to enjoy their trip to Lake Tahoe. Are you ready to secure your very own accommodations at this stellar resort? Fill out the form on this page for more information on becoming a timeshare owner, or call a representative at 1-877-815-4227. Buying a Tahoe Seasons timeshare resale can result in years of great trips to California for a fraction of the cost. Because timeshare resales are sold by owners, and not the resort itself, prices for ownership intervals are often thousands of dollars less than traditional timeshares. You can find amazing units at the Seasons for prices up to 70% lower than retail costs, allowing you to find your ideal accommodations without breaking the bank. Resales at the Diamond Tahoe Seasons Resort come in the form of deeded fixed and floating Diamond timeshare weeks, allowing you to choose an ownership style that matches your vacation preferences. You can also find timeshare resales at the resort in Diamond points, which can allow for a more flexible mode of vacationing. What's more, a resale at the resort could help lead you to bigger and better vacations within Diamond Resorts International. The Tahoe Seasons Resort is affiliated with Diamond Resorts International, a popular timeshare brand with locations around the world. As a resale owner at the Tahoe Seasons, you'll be able to enjoy vacations at the resort using your deeded week. However, you can upgrade your timeshare resale status and earn more exclusive benefits and privileges as a club member with Diamond. By purchasing additional points from the developer, you can upgrade all of your resale points to enjoy DRI Collections vacations, or to explore trips to other destinations through THE Club. The Diamond Resorts Lake Tahoe is affiliated with Interval International, one of the world's largest exchange brands. Timeshare exchange allows you to get the most out of your affordable resale ownership, as it increases the number of vacations and experiences you can gain just by being a timeshare owner. Simply deposit your Lake Tahoe accommodations into the exchange network to trade for stays at comparable resorts in other destinations all over the globe. With the popularity of the Lake Tahoe region on the exchange market, and the convenient location to area attractions at the Seasons, you'll likely be able to trade for vacations at other popular resorts in destinations like Las Vegas, Florida, South Carolina, and more. 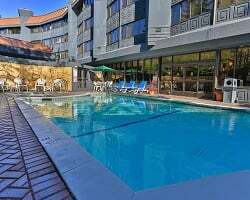 The Tahoe Seasons Resort is equipped with the finest on-site amenities and services to cater to your every need while you enjoy your Lake Tahoe escape. Head to the resort's accessible rooftop for tennis, shuffleboard, or even yoga on the sundeck. Cool down on warm days by visiting the swimming pool, or stay active at the resort's fitness center. Head to the Tramway Tavern and Grille for a drink and a bite to easy during your stay as well. Wintertime visitors will love the immediate access to ski lifts in the adjacent Heavenly Village, while the resort staff can store your equipment after each use. The local area is also filled with things to enjoy during your stay. Heavenly Village is filled with boutique shops and restaurants to entertain families and couples alike for the entire week. Summertime visitors will be delighted to find the lakeshore just a mile away from the resort grounds, where you can swim, paddle board, and boat to your heart's content. Hikers will love exploring Emerald Bay State Park and Van Sickle Bi-State Park, while Harrah's Casino across the border in Nevada provides exciting gaming, dining, and nightlife. 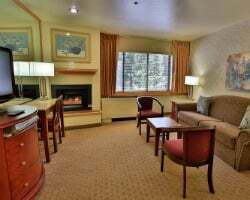 Already Own at Tahoe Seasons Resort?